Dillerville Junction was a complex interlocking controlling access to several important lines on the PRR in the northwestern corner of Lancaster. This remarkable view looking railroad west from the Lancaster Cut-Off depicts the new line veering off to the right connecting with the H&L line to Harrisburg. The old alignment of the H&L into Dillerville and Lancaster still exists and is where Rau's photographic train is sitting behind the interlocking tower. Straight ahead is the connection to the Columbia Branch while the tracks that fan off to the left from that line in the distance are the original alignment and connection to the Old Main to the Queen Street station. The last line of note through the junction is the single track passing left to right in front of the tower crossing all of the PRR tracks at grade, this was the Reading Company's Lancaster Branch, part of its Reading & Columbia Division which terminated at the foot of North Prince Street. The meticulous landscaping, track and ballast work reflect a railroad that took great pride in their physical plant. Image circa 1888 by William H. Rau, Collection of American Premier Underwriters, Inc. In 1835 Revolutionary War officer and Sheriff of Lancaster County, Adam Diller founded Dillerville, a one time separate settlement in Lancaster’s northwest corner. In June of the same year Diller would grant the Harrisburg & Lancaster Railroad a 1.5-acre plot to construct a depot. From these meager beginnings Dillerville would develop to become the western gateway of the Lancaster terminal, evolving with continual improvements after the PRR assumed control of the Philadelphia & Columbia and Harrisburg & Lancaster Railroads. Originally the location where the PRR predecessors split away heading west on their respective routes, DV interlocking as it became known, developed into a far more complex facility with the addition of the Lancaster Cut-Off in 1883. 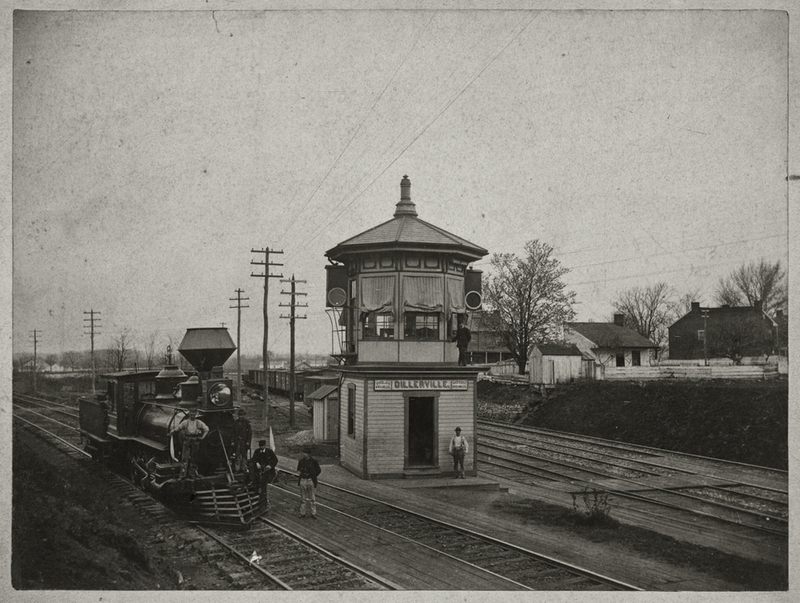 The second know tower in this location was completed in 1884 for the new cut-off utilizing Armstrong levers to control lower quadrant semaphore signals and switch points throughout the junction. This tower was built in the typical style of that era with Victorian details including a slate shingled hip roof and center cupola similar to surviving examples like LEMO tower now located in Strasburg, PA and SHORE at Frankford Junction in Philadelphia. DV was an important facility, directing trains to the Columbia Branch, Old Main, H&L line to Harrisburg and the Lancaster Cut-Off / Main Line east. On either side of the interlocking there were several yards servicing industries on the Old Main and the later plants of Armstrong World Industries and its predecessors. Adding to the complexity of this interlocking was an at grade crossing of the R&C division of the Reading Company who’s Lancaster Branch terminated at the foot of Prince Street in the north west corner of the city. This view looks west depicting the first tower at Dillerville around 1880. To the left is the Columbia Branch of the former P&C and to the right is the former H&L to Harrisburg. Note the sign on this early wood frame octagonal switch tower which proclaims an exact distance of 69 and 30/100 miles to Philadelphia and 283 and 70/100 miles to Pittsburgh. Another noteworthy detail is the early signals utilized to govern traffic at the junction. As evident from Rau's photo in 1888 this junction would be greatly reconfigured with the addition of the Lancaster Cut-off. Photographer unknown, image courtesy of LancasterHistory.org, Lancaster, Pennsylvania. In the late 1920s DV interlocking was part of a consolidation project in preparation for the opening of a new passenger station complex on the Cut-Off centralizing several towers into Lancaster Tower, which was later renamed Cork for its proximity to the PRR’s largest freight customer in the city, Crown Cork & Seal (Armstrong). Another component to this improvements program involved partial abandonment of the Old Line retaining only the segment from West Yard to the freight houses on Water Street. Dillerville Yard continued to serve as a local base of freight operations for the diverse manufacturing and agricultural consignees in the city and beyond on both the Main Line and New Holland Branch. Views looking east and west from the footbridge off Liberty Street in the Dillerville area of Lancaster. (L) Looking west on the Old Main one can see the catenary poles of the Lancaster Cut-Off in the distance coming in from the right. At DV interlocking this line crossed at grade with the Columbia Branch and connected to the former H&L to head west to Harrisburg. (R) Looking east was the remaining segment of the former Old Main which recently terminated at the foot of Mulberry Street and Harrisburg Avenue. Here a bulk transfer trestle, crew base and engine storage area were all recently abandoned when NS completed the new H. Craig Lewis yard part of the Lancaster Northwest Gateway redevelopment project. In 2009 Norfolk Southern, successor of PRR operations in the area (through the purchase of Conrail) began a major reconfiguration of Dillerville Yard in order to accommodate the $75 million Lancaster Northwest Gateway Project, which is developing acres of unused brown fields to provide expansion opportunities for both Lancaster General Hospital and Franklin & Marshal College. Earlier this year the last of the remaining PRR era facilities including the pedestrian bridge, trans-load facility and engine terminal were abandoned after NS dedicated new facilities in a yard named after the late H. Craig Lewis state senator and former NS VP of corporate affairs. Part of more than a century of urban renewal the Northwest Gateway Project is the last effort in removing all rail activity from the city center including the industries the railroads once served completing an effort that began in the 1880's with the construction of the Lancaster Cut-Off.